The beginnings of the German health care system can be traced back to the Middle Ages, when craftsmen were members of guilds. The guilds provided an early form of health insurance based on the principle of solidarity: All guild members paid into a fund which was then used to help individual members if they had financial difficulties, for instance because of an illness. There were also insurance funds organized for factory workers as early as the beginning of the industrial revolution. These different forms of social insurance were then standardized through Otto von Bismarck’s social policies in the late nineteenth century. Health insurance was introduced first, in 1883. Its primary goal was to provide insurance in the event of illness, mainly for workers involved in both industrial and non-industrial production. Anyone who was insured was granted the right to free medical treatment and medicine, as well as sickness benefits and a funeral allowance. 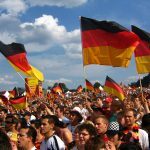 At that time, about 10% of the population had health insurance – compared to nearly 100% in Germany now. The introduction of health insurance in 1883 was closely followed by the introduction of statutory accident insurance (1884) and pension funds (1889). Unemployment insurance was introduced in 1927. 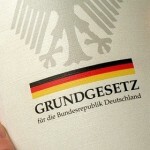 Compulsory insurance: Everyone must have statutory health insurance (“gesetzliche Krankenversicherung” – GKV) provided that their gross earnings are under a fixed limit (“Versicherungspflichtgrenze“). Anyone who earns more than that can choose to have private insurance (“private Krankenversicherung” – PKV). Funding through insurance premiums: Health care is financed mostly from the premiums paid by insured employees and their employers. Tax revenue surpluses also contribute. To give you an idea of what this means: State-funded health care systems like those in Great Britain or Sweden draw on tax revenue. In market-oriented systems such as that in the United States, many people have to carry the costs of treatment and loss of earnings due to illness themselves, or have to get private health insurance. Principle of solidarity: In the German health care system, statutory health insurance members jointly carry the individual risks of the costs of medical care in the event of illness. Everyone covered by statutory insurance has an equal right to medical care and continued payment of wages when ill – regardless of their income and premium level. The premiums are based on income. This means that the rich can help the poor, and the healthy can help the ill. However, these premiums are only calculated based on a percentage scale up to a certain income level (“Beitragsbemessungsgrenze“). Anyone earning more than this amount pays the same maximum premium. Principle of self-governance: While the German state sets the conditions for medical care, the further organization and financing of individual medical services is the responsibility of the self-governing bodies within the health care system. These are made up of members representing doctors and dentists, psychotherapists, hospitals, insurers and the insured people. 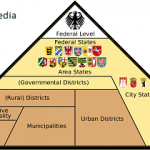 The Federal Joint Committee (“Gemeinsamer Bundesausschuss” or G-BA – please also see below: “Structure and institutions of the health care system”) is the highest entity of self-governance within the statutory health insurance system. 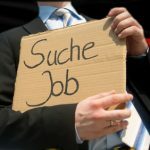 If you are an employee and you earn less than €57,600 a year (€4,800 a month in 2017), you have to take part in the government health scheme – Gesetzliche Krankenversicherun or GKV – taking out health insurance as soon as you’ve signed your work contract. The scheme is administered by around 110 Krankenkassen, non-profit making associations who must all charge the same basic rate of 14.6% of your eligible gross salary, up to a maximum of €4,350 a month in 2017 (€52,200 annually). You don’t pay more than this even if your income is higher. This amount is shared equally between you and your employer. You have to stay with a particular Krankenkasse for 18 months, after which time you can switch to another government scheme. Employed workers only pay contributions if they earn over €850 per month. GKV covers you for primary care with registered doctors, hospital care (both in- and out- patient) and basic dental treatment. Non-working dependents living at the same address and registered with the Krankenkasse are covered at no extra cost. GKV does not cover consultations with private doctors, private rooms in hospitals, alternative or complementary treatments, dental implants or glasses/contact lenses for adults. a civil servant or certain other public employee. PKV usually covers a much wider range of medical and dental treatments than GKV. Companies offer different levels of cover, premiums depend on age at entry into the scheme and any pre-existing conditions and cover is usually per person rather than per family as with the government insurance schemes. Part of medical insurance premiums is tax-deductible. 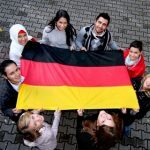 Based on German healthcare legislation, if you live in Germany long-term or work in Germany, you must register with the German authorities at your local town hall (Einwohnermeldeamt). Once you are registered, have a social insurance number (Sozialversicherungsnummer) and you’re making national insurance contributions, you are entitled to state-run healthcare the same as German nationals. In order to access this, you also have to register with a health insurance fund. A non-working spouse and children are covered by the same insurance. 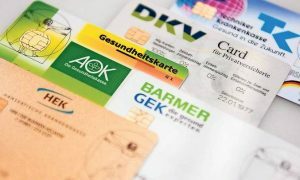 Your insurer will give you a health insurance card (Krankenversichertenkarte), which you have to take with you each time you visit any doctor, dentist or specialist in Germany. Since 2014 an electronic eHealth card with a photo of the holder (unless under 15) is proof of entitlement to medical services and benefits. The card, which contains your name, date of birth, address and health insurance data, is scanned when you visit a medical service. 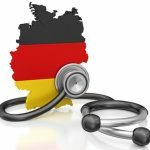 If you already have an European Health Insurance Card (EHIC) you can get free medical treatment in Germany while you are in the country temporarily. The patient contribution (or co-payment) is not reimbursable. Once you take up official residence and/or employment you are no longer covered by the EHIC and must take out German health insurance and get a Krankenversicherungskarte (health insurance card). If you don’t have an EHIC and are not paying German national insurance you must take out private health insurance – or pay the full costs for any medical costs you incur. Doctors are called Ärzte; a Hausarzt is the equivalent of a GP or primary care doctor. Under the German healthcare system, you are free to choose your own doctor. Many speak at least basic English. Some doctors only treat private patients, so if you have state insurance make sure to check beforehand otherwise you will have to pay for treatment. Doctors who treat patients as part of the statutory health scheme must be registered with the Association of Statutory Health Insurance Physicians or Kassenärztliche Vereinigung. Look for a sign in the surgery saying Kassenarzt or Alle Kassen. 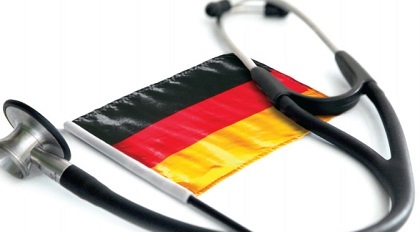 You can find a doctor through a personal recommendation, your embassy, the Gelbe Seiten (yellow pages), on the Weisse Liste (in German) or online. Practice hours are usually from 8am–1pm and from 3pm–6pm from Monday to Friday; many are closed on a Wednesday afternoon. Few practices are open on Saturdays and only emergency services operate on Sundays. Some doctors have an ‘open door’ policy where you can just turn up at the surgery but be prepared for a long wait. Others operate an appointment system, so you’ll need to phone the practice beforehand. If it’s urgent then you will be given an appointment immediately or on the same day; if it’s not you may have to wait for a few days or even weeks. Don’t forget to take along your health insurance card to your appointment. If you have state insurance, the practice will send the bill direct to your health insurer; if you have private insurance, you will typically pay upfront and be reimbursed by your insurance company later. Everyone has to pay a fee of around €10–15 in cash for their first visit every quarter (private patients can reclaim this). You will need to be referred to a specialist in a hospital by your GP. 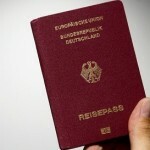 You should take your EHIC or German health insurance card when you visit. You have to pay a fixed charge of around €10–15 per day, up to a maximum of 28 days in a year. If you are under 18 years old you do not have to pay. If you’re going to be an in-patient, note that hospitals have a certain amount of space allotted to patients with public insurance and for those with private insurance. If you have a ‘private’ room it means covered by private insurance rather than room for your use only; these private rooms are generally used for two patients who are separated by a curtain. Take your own soap and personal items. I need an ambulance – Ich brauche einen Krankenwagen. 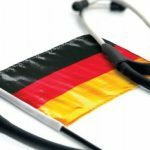 I need a doctor – Ich brauche einen Arzt. I need a hospital – Ich brauche ein Krankenhaus. There’s been an accident – Es gab einen Unfall.